Często sprawdzam stronę eyeka.com na której można zgłaszać swoje projekty do konkursów ogłaszanych przez firmy i wygrać za to pieniążki. Dzisiaj zgłosiłem 2 pomysły. Dotyczą stworzenia nowej atrakcji turystycznej w Singapurze związanej z fauną i florą otaczającego deszczowego lasu tropikalnego. Poniżej pomysły, niestety w języku angielskim. Jak ktoś nie rozumie to Google Translator i już. Promenade above the tree level. Thinking about tropical forest I can only see the thickness of all the plants inside it. I would love to see the forest but walking through is always a challenge. So I’ve thought about a solution that I saw one day. 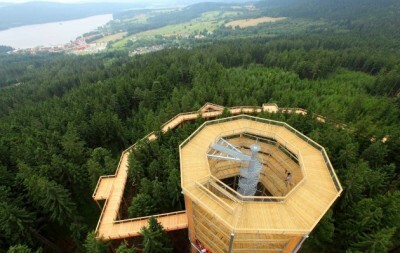 It is a promenade situated above the forest. From such promenade you can see the forest from above. It gives you an outstanding chance to see a totally different world. I would say the point of view is the key. On the picture below you can see an example of such promenade. It is a small one. The one I am thinking of must match the Singapore! It has to be the biggest, the longest, the best. It can be featured with small cafe’s, restaurants and many viewing points with lunettes. 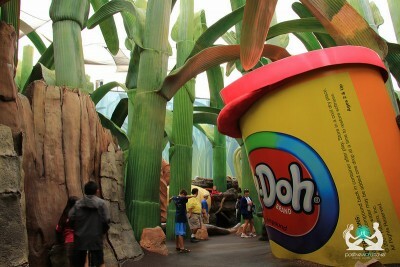 It should be a new place to spend a day in and everything on the top of the rain forest. Many of us have seen the blockbuster movie „Honey, I shrank the kids”. Many of us have thought how it would be if we would be so small. And I have thought – hey, why not? Imagine that you are so small that an ant looks like your dog and spider walks over you, a grass looks like trees and so on. My idea is to create a theme park based on resizing effect. 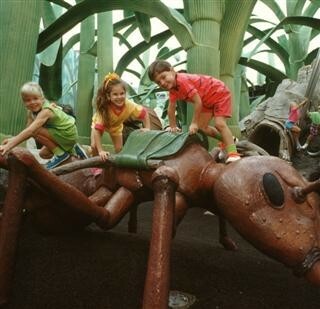 Most of the park would be equipped with artificial plants and insects but some of them would be real one. Most of the plants will be a copy from original ones from tropical forest around. 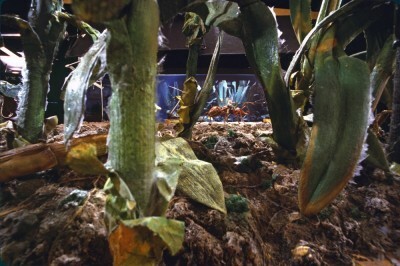 Beside creating artificial plants and animals I would like to use very big magnifying glasses. Behind these magnifying glasses we would place some real animals to add more realism to our park. The park should also be featured with common objects that can be found in the forest or garden for example: hut, watering can, matches, litter. It will emphasize the effect of being very small. PS: At the gate of the shranked world people would be illuminated by laser light. It will be the „resizing rays”. After that they are entering the park as the small creatures. And few photos from a set of the movie „Honey, I shrank the kids”.